If you follow me on social media, you will have noticed that a little while ago I trotted off to Yorkshire to do some filming with none other than Linda Barker. Oh my, what a treat and what an experience. We were hosted in Linda’s Yorkshire home, in her kitchen, whilst discussing a recent survey by Wren Kitchens. I’ve written before about Linda Barker’s collaboration with Wren Kitchens (her designs are brilliantly contemporary and edgy), and this survey looks at our decorating and diy habits. Doesn’t her own kitchen look incredible? In fact, Linda was kind enough to give us a tour of her cottage – full of greys, natural textures and real wood. We even discussed some of her latest wallpaper acquisitions! Filming took place during the afternoon and was really relaxed and great fun. Linda was an excellent host, and so easy to work with; she made us feel really at ease with her warmth and charm. 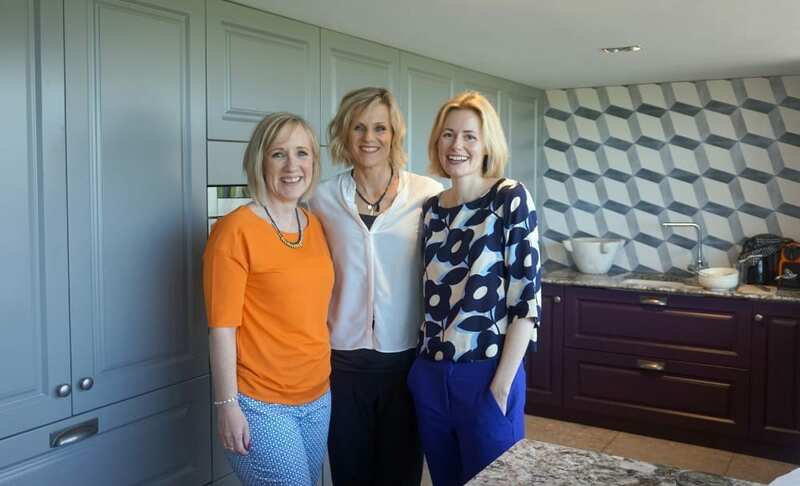 I was joined by lifestyle blogger Kathryn, from Kat Got the Cream, and together the three of us set about discussing some of the results from the Wren Kitchens Survey. The survey covers all kinds of topics around decorating, diy and kitchens, but one question in particular really resonated with me. Do Homeowners find choosing decor and furniture stressful? It’s something I’ve struggled with over the years, and still do at times, even though I feel like I should be more of a pro at it than I am. I’m sure I’m not the only one to say I get overwhelmed by choice. I love looking at so many things for the blog, that sometimes I lose sight of my own tastes. I do have to remind myself to hold onto that sometimes. This questions brought about some interesting discussion with Linda and Kat. And some useful tips too. Do you and your partner argue when you head off to furniture shopping? Do you have to compromise on the pieces of furniture that you buy? Or is one of you not really interested? How much planning do you do before you go out shopping? This last one raises some interesting points, and we discuss it at length in the film. Linda, as an interior designer, is of course used to choosing and selecting the right colour palette and furniture pieces, but has some great advice on how to do this yourself. I’m a huge Pinterest or Polyvore fan so would advocate creating a digital moodboard to help you and your partner visualise the scheme you want for a room, and keep you on track when you go out shopping. It’s a great way to stay on budget too. How about you, do you find choosing decor and furniture stressful? Wren Kitchens is also running a giveaway with the chance to win £500 to spend at Wren on any of their products. All you have to do is follow the instructions in the Rafflecopter below and tweet the message. What a great trio you make, lovely to hear your thoughts – dream team! Super video, hubby takes the easy option and goes with the flow and usually loves what I choose. However he will say if he doesn’t like it and then we try and compromise! I love this well done Jen. Don’t you make a fantastic team! Fantastic tips, loved the video.